You can search on your address and locate the cell tower, multipurpose towers, microwave arrays and radio wave antennas that are beaming EMF at you, and find out what types of EMF they are broadcasting, who owns them, which ones are registered and which are not, what kinds of towers are planned in the near future for your area, and more, displaying it all within a 4 mile radius from your house. The cell coverage map below is an example of what you'll see - you can also switch between the street map and the satellite map. With this information you can locate the tower nearest you and actually go find it in your neighborhood to visually inspect what kinds of broadcasting devices it uses, what directions they are pointed etc. Then using some basic arithmetic to calculate your distance from the source, the nature of radiation source, its broadcast range etc. you can determine the radiation levels you are being exposed to. The red monopoly-game looking house you see in the picture is the address you searched on and all the images you see within the circle represent cellphone towers within a four mile radius of your house. The blue Eiffel-Tower-looking icons represent towers taller than 200'; any red Eiffel Tower icons depict the towers that have been approved for construction but are not yet in operation. 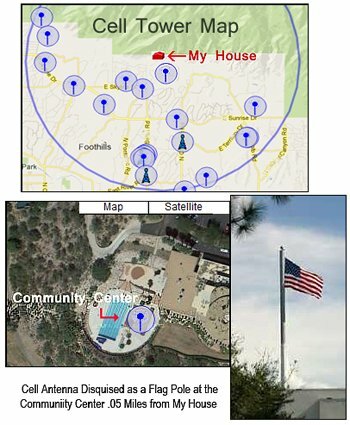 The blue lollypop-looking icons represent single or multi cell antennas that are typically between 150' to 200' (such as the sly flag pole antenna nearest my house). Once you see the actual number of cell towers and antennas (using the celltower locator map above) that are right now exposing you and your family to high levels of radio microwave radiation in your own home or office you'll want to know where to find help for personal protection from the impact of celltowers. That is where Cellphone Safety for Smart Users comes in! Cellphone Safety for Smart Users - is the self-guided online video training guide designed to provide serious help using easy solutions as you learn "how much celltower exposure is too much?" and what to do to protect yourself better within minutes. In this user-friendly stop/go video training you will learn to evaluate your exposure levels from both towers and cellphones, how cellphones and towers actually function so you can adopt the safety-minded habits and strategies you need for lowering your radiation exposure in everyday situations. PS - Check out the free EMF training videos featured on this same "Featured Training Courses" page. Recognizing the various types of devices that emit radiation when you are looking at a broadcast tower or antenna. How cellphone radiation levels compares to cell tower radiation levels. The public outcry against these types of towers in Europe. The legal loophole that allows these towers to proliferate despite their known health hazards. Safe Cellphone Use for Smart Users - gives you all the info you need to begin being safer from cellphone and celltower radio microwave radiation starting right now. Find out how near is too near to live near, and what studies are saying regarding the health hazards of living in proximity to a tower. Cell Phone Radiation Standards - learn about the inadequate FCC cellphone safety standards that are currently in effect even though they were established in 1996 and based on outdated research from the 1980's, and find out what the FCC is doing about it. Free Guide for Safe Cell Phone Use - This 6-page guide gives you the 20 key rules to being a smart safe cellphone user, including which phones are the safest, what to be aware of regarding cellphone shields, how to handle your phone for safest exposure and more.